For a little more than two months, we’ve been exploring some success tips for your author blog. Today, we’re going to recap the best of these tips as we prepare to shift to discussions of other social media sites. The most popular time for blog reading is 10 a.m.
Bloggers are generally highly educated, with as many as 75 percent having college degrees. As many as 83 percent of book bloggers are female. Do you have the time to devote to a blog? How much will you enjoy it? Of course, I had to go on a little rant about a particular pet peeve of mine: Reposting someone else’s content is NOT blogging! Gives you a reason to write regularly. Helps you get to the point. Allows you to explore many different writing styles. One big boo-boo I noticed during my author blog series was a number of blogs that were very challenging to read because the background image overpowered the text. Note to self: this mistake is avoidable! Guest blogging is a great way to increase your author blog’s exposure. For one reason, it instantly puts your message in front of an audience it took the blog owner perhaps years to develop. Commenting is another essential aspect of developing your author blog. This includes commenting on other relevant blogs, as well as encouraging thoughtful comments on your blog. Though blog ideas are like soap bubbles for some people, they may be harder to come by for others. Here’s a list of 27 .ideas for your author blog. Can your blog become a book? Is it better to have the book first, and then the blog? Chicken … egg … you decide. Of course, one of the most important things to your author blog success is traffic. But there’s a BIG difference between general traffic – even in huge numbers – and targeted traffic. In your zest for followers and comments, you may also notice other metrics about your blog. We like the maps that allow us see where in the world our readers are. You work so hard to create the posts on your author blog. Here are a few thoughts on protecting your author blog content. Some basic author blog questions – but if you’re a newbie, how will you know if you don’t ask? What’s the difference between Tags and Categories? And how important are pages? Besides the tags and categories, another important but often underused aspect of author blogs is the sidebar. Are you using yours to your best advantage? Then, of course, there are the ubiquitous keywords for your author blog. Choose carefully, as they make a HUGE difference in how well your blog gets ranked in the search engines. After all that effort authors put into their blogs, an amazing number commit a huge error: failing to make their contact info readily available. 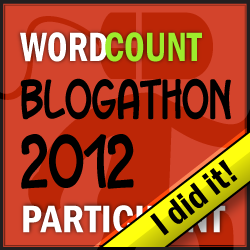 One additional excellent way to market your blog is by joining a blog challenge. If you’re an author who’d like to take part in one, we invite you to join the 28-day Author Blog Challenge, which will kick off June 2, 2012. And, lastly, we offered tips from A to Z about setting up a blog tour to promote your book. Wednesday, May 2 – In honor of Marcie’s first anniversary, we’re launching the Author Blog Challenge! While the old-fashioned book tour still exists, going from city to city and bookstore to bookstore, it’s certainly much rarer, and tends to be an event reserved for bigger named authors with more publishing caché. Thanks to the Internet, lesser known and self-publishing authors still have a means of “getting around” via the virtual blog tour. Those who have done it will tell you it’s still a LOT of work, but much less costly than booking plane flights and hotel stays. The following, while not necessarily in chronological order, are tips for creating a successful blog tour. ADVANCE. Start early. Figure out how much time it will take you to compile a list of potential participants, contact them, agree to the terms, send them a copy of your book, and schedule your tour. You will not start a blog tour today and get it ramped up by the end of the month – or even the end of next month. Note, as per Pump Up Your Book: Be prepared to send a second copy to the contest winner once you receive their mailing info from your blog tour participant. BIGGER BLOGGERS. Approach the bigger bloggers. Sure, they may be inundated with requests, but if you write a solid pitch and you have a good book that falls into their particular favorite genre, they may say yes. And the worst they’re going to say is no, which means you’re no further behind than you were before you asked them. You might go on a list with 20 authors ahead of you – but if exposure on their blog is worth it, you’ll agree to wait. COMMENTS. Look for blogs that are well trafficked and receive lots of comments. One caveat, however: blogs that offer contests often use the comment section to manage contest entries. So READ the comments; don’t just look at the numbers. Look also for bloggers who are posting content from lots of different sources, as those writing only about their own books are unlikely to be good targets for your tour. DATES. Choose the dates for your tour. Make sure to publicize them on your website calendar, blog calendar, and social media sites. FOLLOW UP. Create a checklist of steps and make sure you follow it with every blogger. Remember, the bigger, better bloggers are deluged with these kinds of requests – so after they say yes, make sure to follow up to be sure you’re on target for your guest appearance. GOOGLE BLOGSEARCH is the place to begin your research for book bloggers who read and write on your genre. INTERVIEWS. Interviews are probably the easiest way for an author to take part in a blog tour. Get a jump on this by writing some prepared questions for the blogger to ask you – and have your answers ready to go, too. JUST ASK. No one is likely to beat your door down inviting you to guest post on their blog, so you’ve got to go after them. Get over your fear that you’re just little old you, your concern that your book’s not good enough, and your worry that you don’t know what you’re doing and JUST ASK. LIST. Make a list of the bloggers you will approach. You might start with 25 to 30, and eventually winnow that list to about a dozen. MESSAGING. Make sure you and your host bloggers are on the same page, in terms of the way they will present your information and what they will say about your book. If it’s a review, they may not tell you ahead of time – so be prepared for anything. PARAMETERS. Determine what you want the blogger to do. Is your preference for the blogger to interview you? Review your book? Host a giveaway of your book? Feature your book in a post they write? All of the above? Be clear about your goals, but willing to negotiate a bit with each blogger, accordingly. I love your blog about [SUBJECT]. I’ve recently written a book that falls into your genre of [NAME OF GENRE]. I would really appreciate it if you would consider being part of the blog tour to launch the publication of [TITLE OF YOUR BOOK]. Would you consider running either a brief review or an excerpt from the book on its publication date [INSERT DATE] or within the week thereafter? The excerpt can be of your own choosing, or I can supply you with one, and as such, be your guest blogger for that date. Or, if you prefer, I am happy to do a Q & A via e-mail. I appreciate your consideration and hope you will participate. Please respond at your earliest convenience. If yes, please send me your mailing address so I can send a copy of the book to you. If you’d like to do a giveaway, please let me know that, as well, so I can send an extra copy. REVIEWS. Request a review as part of the blogger’s participation. Ideally, the blogger will post the review on their blog, but you will also post the review (or a link to it) on your Amazon page, on other book sites, and on both of your social media sites. SOCIAL MEDIA. Make sure the bloggers you’re considering have a good social media presence before you approach them. THANK YOU. These bloggers usually do these reviews/blog tours for no compensation other than a free book – so if they participate in your tour, the very least you can do is say thank you publicly! A small gift card would be an even nicer gesture. UNUSUAL GIVEAWAY. Giveaways are almost ubiquitous with participation in a blog tour. Consider giving away your book, of course, but something additional as well that’s special and perhaps unique (e.g., a PDF of your revised first chapter, so the reader can see your process as an author). VARY IT UP. If you are providing the content for your blog tour hosts, make sure each post is a little bit different so you don’t get dinged in the search engines for too much duplicate content. Where possible, tailor the content to each blogger’s specific style or needs. WIN-WIN. Don’t head into a blog tour with your hand out. Begin several months in advance and build relationships with the bloggers you plan to approach. Make sure that when you do approach them, you’re proposing a win-win opportunity for the blogger. One great way to do this is by offering to reciprocate by promoting them on your blog for a certain amount of time. XTRA MILE. Go there! 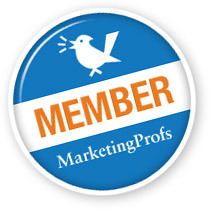 Reach out to book blogger groups, asking even those who aren’t part of your tour to promote it. YOUR OWN BLOG. If you don’t already have a blog, start one now! Even if your book is just in the planning stages, it’s NEVER too early to get your blog up and running and scoring in the search engines. ZOOM IN. Follow every blog you’re targeting every day leading up to your post. Comment, where appropriate. And once your post hits, with the blogger’s OK, respond to any comments on your post. Best of luck with your blog tour. If you want to the Marcie Brock blog to be one of your stops, just ask! Become part of a supportive community. Make great new friends and connections. A blog challenge gives you reason to post regularly, and the more often you post, the better your blog will rank in the search engines. By expanding your participation to your social networks, you can leverage the power of all the participants in the challenge to increase exposure for everyone’s blogs. Additionally, the blog host will usually create links to the home page of your blog, and possibly to certain individual posts, further helping drive traffic your way. And, according to a guest post by Michael Ooi at AllBloggingTips.com, visitors who are recommended to your blog by other bloggers generally spend twice as much time reading your posts than those who find you through search engines. Managing your own blog can be a lonely endeavor. You write, hoping people find your posts, read them, and interact via the comments section. Those comments and “likes” are a form of validation, and who can blame us for desiring some sort of confirmation that we’re on the right track with all our posts? Participating in a blog challenge gives you a built-in community of like-minded bloggers, particularly in a themed challenge like the Author Blog Challenge. While your reasons and goals for participating may differ somewhat, you all have certain things in common, and you’re in the perfect position to read, comment, and support each other. Further to the idea of a supportive community, you may find through your blog participation significant new connections, and who knows where those connections can take you? You should not feel obligated to read every post from every participant; in fact, certain bloggers will likely resonate more with you. However, give as many blogs as possible a chance, and you may find yourself creating unlikely alliances that would never have happened under any other circumstances. Get noticed by industry leaders. Create content you can turn into products, other than your book, for sale on your blog. Receive suggestions for improving your blog posts, layout, SEO, etc., from more experienced bloggers who are participating in the blog challenge. 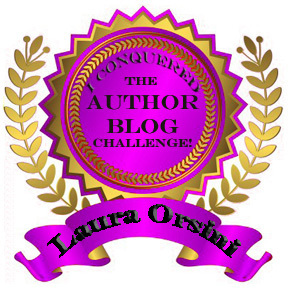 The Author Blog Challenge begins June 2, 2012. Hope to see you on our participants’ list! Friday, April 20 – Are you making the best use of your author blog’s sidebars?